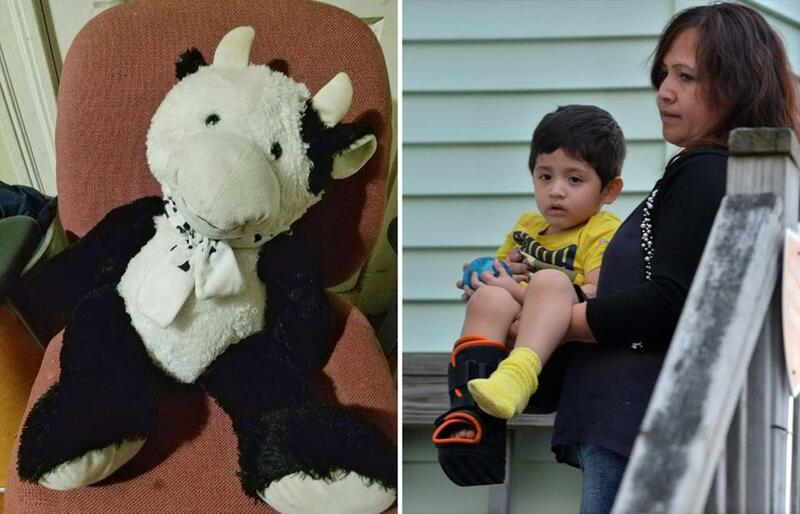 Luis Eduardo Gomez, of Chelsea, was carried home from the hospital by his mother after the boy fell out of a second-story window, landing on his stuffed animal (at left). A 2-year-old Chelsea boy survived a 16-foot fall from a second-story window after he landed on his stuffed animal, officials said. The boy was jumping on his bed around 4:40 p.m. Wednesday when an unlucky bounce sent him right out the window, said Chelsea Deputy Fire Chief John Quatieri. Fortunately, the boy, Luis Eduardo Gomez, was holding onto a large stuffed cow that he landed on, cushioning him from the worst of the impact, said Quatieri. The toy was between 2 and 2½ feet long. “He fell about 16 feet onto concrete. He could easily have broken bones or been very seriously injured,” said Quatieri. His safe landing, aided by the stuffed animal, is nothing short of a miracle, said the boy’s great-uncle, Luis Estrada. The boy was alert and conscious when responders arrived, having received only minor injuries, said Quatieri. “He had some abrasions and a laceration on his forehead, but we think he’s going to be OK,” said Quatieri. Estrada said the boy was playing with his 12-year-old sister when he fell from the window onto a concrete slab in the family’s backyard. The boy was taken to Massachusetts General Hospital and held overnight for observation. He was deemed to be in good health and released Thursday morning, said Chelsea Police Chief Brian Kyes. Quatieri called the incident “certainly quite strange” and said it was “the first time something like it had happened in [his] 25-year career,” but Kyes said that children falling from windows is not uncommon. The family moved to Chelsea just five months ago from Guatemala. The stuffed cow is a favorite of Luis Eduardo’s, and he takes it everywhere with him, his uncle said. Andrew Grant can be reached at andrew.grant@globe.com. Catie Edmondson can be reached at catie.edmondson@globe.com.